After Alphage had governed the see of Canterbury about four years, with great reputation to himself, and benefit to his people, the Danes made an incursion into England, and laid siege to Canterbury. When the design of attacking this city was known, many of the principal people made a flight from it, and would have persuaded Alphage to follow their example. But he, like a good pastor, would not listen to such a proposal. While he was employed in assisting and encouraging the people, Canterbury was taken by storm; the enemy poured into the town, and destroyed all that came in their way by fire and sword. He had the courage to address the enemy, and offer himself to their swords, as more worthy of their rage than the people: he begged they might be saved, and that they would discharge their whole fury upon him. They accordingly seized him, tied his hands, insulted and abused him in a rude and barbarous manner, and obliged him to remain on the spot until his church was burnt, and the monks massacred. They then decimated all the inhabitants, both ecclesiastics and laymen, leaving only every tenth person alive; so that they put 7236 persons to death, and left only four monks and 800 laymen alive, after which they confined the archbishop in a dungeon, where they kept him close prisoner for several months. During his confinement they proposed to him to redeem his liberty with the sum of 3000 pounds, and to persuade the king to purchase their departure out of the kingdom, with a further sum of 10,000 pounds. As Alphage's circumstances would not allow him to satisfy the exorbitant demand, they bound him, and put him to severe torments, to oblige him to discover the treasure of the church; upon which they assured him of his life and liberty, but the prelate piously persisted in refusing to give the pagans any account of it. They remanded him to prison again, confined him six days longer, and then, taking him prisoner with them to Greenwich, brought him to trial there. He still remained inflexible with respect to the church treasure; but exhorted them to forsake their idolatry, and embrace Christianity. This so greatly incensed the Danes, that the soldiers dragged him out of the camp and beat him unmercifully. One of the soldiers, who had been converted by him, knowing that his pains would be lingering, as his death was determined on, actuated by a kind of barbarous compassion, cut off his head, and thus put the finishing stroke to his martyrdom, April 19, A.D. 1012. This transaction happened on the very spot where the church at Greenwich, which is dedicated to him, now stands. After his death his body was thrown into the Thames, but being found the next day, it was buried in the cathedral of St. Paul's by the bishops of London and Lincoln; from whence it was, in 1023, removed to Canterbury by Ethelmoth, the archbishop of that province. This is the final podcast in this series. 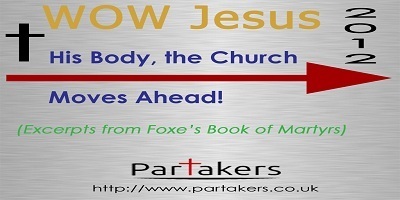 You can download an e-book copy on which these Podcasts are based "Foxes Book of Martyrs" by visiting this Bible Study Tools site. During the ministry of this meek prelate, Pepin was declared king of France. It was that prince's ambition to be crowned by the most holy prelate he could find, and Boniface was pitched on to perform that ceremony, which he did at Soissons, in 752. The next year, his great age and many infirmities lay so heavy on him, that, with the consent of the new king, and the bishops of his diocese, he consecrated Lullus, his countryman, and faithful disciple, and placed him in the see of Mentz. When he had thus eased himself of his charge, he recommended the church of Mentz to the care of the new bishop in very strong terms, desired he would finish the church at Fuld, and see him buried in it, for his end was near. Having left these orders, he took boat to the Rhine, and went to Friesland, where he converted and baptized several thousands of barbarous natives, demolished the temples, and raised churches on the ruins of those superstitious structures. A day being appointed for confirming a great number of new converts, he ordered them to assemble in a new open plain, near the river Bourde. Thither he repaired the day before; and, pitching a tent, determined to remain on the spot all night, in order to be ready early in the morning. Some pagans, who were his inveterate enemies, having intelligence of this, poured down upon him and the companions of his mission in the night, and killed him and fifty-two of his companions and attendants on June 5, A.D. 755. Thus fell the great father of the Germanic Church, the honor of England, and the glory of the age in which he lived. Proterius was made a priest by Cyril, bishop of Alexandria, who was well acquainted with his virtues, before he appointed him to preach. On the death of Cyril, the see of Alexandria was filled by Discorus, an inveterate enemy to the memory and family of his predecessor. Being condemned by the council of Chalcedon for having embraced the errors of Eutyches, he was deposed, and Proterius chosen to fill the vacant see, who was approved of by the emperor. This occasioned a dangerous insurrection, for the city of Alexandria was divided into two factions; the one to espouse the cause of the old, and the other of the new prelate. In one of the commotions, the Eutychians determined to wreak their vengeance on Proterius, who fled to the church for sanctuary: but on Good Friday, A.D. 457, a large body of them rushed into the church, and barbarously murdered the prelate; after which they dragged the body through the streets, insulted it, cut it to pieces, burnt it, and scattered the ashes in the air. The first part of the bloody entertainment was finished; the bodies of the dead were dragged off with hooks, and the reddened sand covered with a fresh, clean layer. After this had been done the gates in the wall of the arena were thrown open, and a number of tall, well- formed men in the prime of youth and strength came forward. Some carried swords, others three-pronged spears and nets. They marched once around the walls, and stopping before the emperor, held up their weapons at arm's length, and with one voice sounded out their greeting, Ave, Caesar, morituri te salutant! "Hail, Caesar, those about to die salute thee!" The combats now began again; the gladiators with nets tried to entangle those with swords, and when they succeeded mercilessly stabbed their antagonists to death with the three-pronged spear. When a glatiator had wounded his adversary, and had him lying helpless at his feet, he looked up at the eager faces of the spectators, and cried out, Hoc habet! "He has it!" and awaited the pleasure of the audience to kill or spare. His dress showed him to be one of the hermits who vowed themselves to a holy life of prayer and self-denial, and who were reverenced by even the thoughtless and combat-loving Romans. The few who knew him told how he had come from the wilds of Asia on a pilgrimage, to visit the churches and keep his Christmas at Rome; they knew he was a holy man, and that his name was Telemachus--no more. His spirit had been stirred by the sight of thousands flocking to see men slaughter one another, and in his simple-hearted zeal he had tried to convince them of the cruelty and wickedness of their conduct. He had died, but not in vain. His work was accomplished at the moment he was struck down, for the shock of such a death before their eyes turned the hearts of the people: they saw the hideous aspects of the favorite vice to which they had blindly surrendered themselves; and from the day Telemachus fell dead in the Colosseum, no other fight of gladiators was ever held there. Bishop Basil made himself first famous by his opposition to Arianism, which brought upon him the vengeance of the Arian bishop of Constantinople; he equally opposed paganism. The emperor's agents in vain tampered with Basil by means of promises, threats, and racks, he was firm in the faith, and remained in prison to undergo some other sufferings, when the emperor came accidentally to Ancyra. Julian determined to examine Basil himself, when that holy man being brought before him, the emperor did every thing in his power to dissuade him from persevering in the faith. Basil not only continued as firm as ever, but, with a prophetic spirit foretold the death of the emperor, and that he should be tormented in the other life. Enraged at what he heard, Julian commanded that the body of Basil should be torn every day in seven different parts, until his skin and flesh were entirely mangled. This inhuman sentence was executed with rigor, and the martyr expired under its severities, on June 28, A.D. 362. G’day and welcome to Partakers and our series Church Moves Ahead, where we look together at the history of the early church, and in particular its persecution. We are taking brief excerpts from an ancient book, Foxes Book of Martyrs. This excerpt is the Persecutions Under the Arian Heretics. The author of the Arian heresy was Arius, a native of Libya, and a priest of Alexandria, who, in A.D. 318, began to publish his errors. He was condemned by a council of Libyan and Egyptian bishops, and that sentence was confirmed by the Council of Nice, A.D. 325. After the death of Constantine the Great, the Arians found means to ingratiate themselves into the favour of the emperor Constantinus, his son and successor in the east; and hence a persecution was raised against the orthodox bishops and clergy. The celebrated Athanasius, and other bishops, were banished, and their sees filled with Arians. In Egypt and Libya, thirty bishops were martyred, and many other Christians cruelly tormented; and, A.D. 386, George, the Arian bishop of Alexandria, under the authority of the emperor, began a persecution in that city and its environs, and carried it on with the most infernal severity. He was assisted in his diabolical malice by Catophonius, governor of Egypt; Sebastian, general of the Egyptian forces; Faustinus, the treasurer; and Heraclius, a Roman officer. The persecutions now raged in such a manner that the clergy were driven from Alexandria, their churches were shut, and severities practiced by the Arian heretics, were as great as those that had been practiced by the pagan idolaters. If a man, accused of being a Christian, made his escape, then his whole family were massacred, and his effects confiscated. G’day and welcome to Partakers and our series Church Moves Ahead, where we look together at the history of the early church, and in particular its persecution. We are taking brief excerpts from an ancient book, Foxes Book of Martyrs. This excerpt is the Persecutions of the Christians in Persia. It is here proper to take notice of the singular but miserable fate of the emperor Valerian, who had so long and so terribly persecuted the Christians. This tyrant, by a stretagem, was taken prisoner by Sapor, emperor of Persia, who carried him into his own country, and there treated him with the most unexampled indignity, making him kneel down as the meanest slave, and treading upon him as a footstool when he mounted his horse. After having kept him for the space of seven years in this abject state of slavery, he caused his eyes to be put out, though he was then eighty-three years of age. This not satiating his desire of revenge, he soon after ordered his body to be flayed alive, and rubbed with salt, under which torments he expired; and thus fell one of the most tyrannical emperors of Rome, and one of the greatest persecutors of the Christians. A.D. 260, Gallienus, the son of Valerian, succeeded him, and during his reign (a few martyrs excepted) the Church enjoyed peace for some years. G’day and welcome to Partakers and our series Church Moves Ahead, where we look together at the history of the early church, and in particular its persecution. We are taking brief excerpts from an ancient book, Foxes Book of Martyrs. This excerpt is from The Eighth Persecution, Under Valerian, A.D. 257. G’day and welcome to Partakers and our series Church Moves Ahead, where we look together at the history of the early church, and in particular its persecution. We are taking brief excerpts from an ancient book, Foxes Book of Martyrs. This excerpt is from The Eighth Persecution, Under Valerian, AD257. In the year 258, Marcianus, who had the management of the Roman government, procured an order from the emperor Valerian, to put to death all the Christian clergy in Rome, and hence the bishop with six of his deacons, suffered martyrdom in 258. Sextus succeeded Stephen as bishop of Rome. He is supposed to have been a Greek by birth or by extraction, and had for some time served in the capacity of a deacon under Stephen. His great fidelity, singular wisdom, and uncommon courage distinguished him upon many occasions; and the happy conclusion of a controversy with some heretics is generally ascribed to his piety and prudence. Right mouse click to save this Podcast as a MP3 (file name to be attached! ).